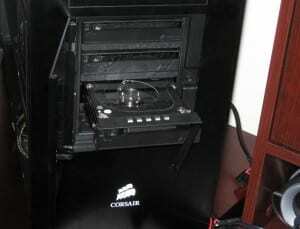 We all know the popular brand name Corsair for making Memory, Power Supplies, cooling, and even some storage items. They have done more than admirable jobs in those areas as well. Now, Corsair has dipped its toes into the computer case market. Judging from the size and looks of this beast, it wasn’t a dip, but a head-first dive. Let’s take a more in-depth look at this case. To start off, this case is very large and robust. 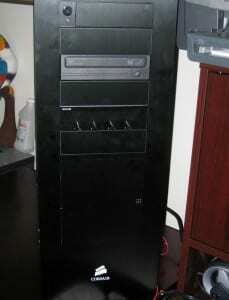 In fact it dwarfs my old Antec 1200 by 2” in height and depth and 1/2” in width. Weighing in at around 38lbs empty, its black brushed aluminum shell and steel internals remind me a bit of a Skunk works type project from the USAF instead of a mere computer case. The interior shows a gratuitous amount of grommeted holes for cable management. 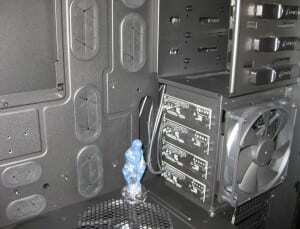 It also has isolated cooling compartments for the power supply, hot-swappable SATA bays and mainboard area. Another great feature on this case is that the motherboard tray has a removable CPU back plate panel for easy heat sink installation. 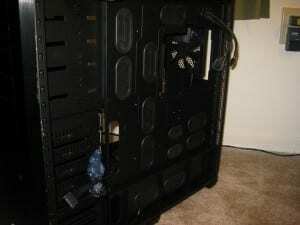 The accessory panel is on the top of this case and features a touch open/close door. Behind the door hides four USB, audio (mic/headphones), firewire, and the reset button. One item I did not notice that would have been a nice addition for a high-end case was an eSATA port. The power button and hard drive activity light (white LED) sit outside the panel, just to the left. A large plexiglass side window allows the user to show off what is likely to be an aesthetically pleasing interior with all parts mounted and wires tucked away. 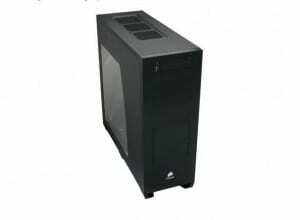 The case comes with a bag of screws for various applications, a vibration absorbing grommet for the not included 120mm fan for the lower hard drive bay, four black SATA cables, as well as the custom SATA power cable for the hot-swappable bays. The actual installation in this case was an absolute breeze with all the room it has available. It did not take much thought as far as the water cooling setup and where the parts were going to go for proper placement inside the case. There is ample room for a 3×120 sized radiator up top, even a double deep model such as the Thermochill PA120.3. One important thing to note however is the pre-drilled holes up top fit the Swiftech style screw spacing perfect. This was not a major problem with the PA120.3 though. Either end of the massive radiator matched up nicely with the case’s radiator mounting holes. Even with only four screws on one end holding up the PA120.3, it was still quite secure even when fully loaded. Unfortunately, due to user error on my part, the PA120.3 was removed after I had punctured a couple of holes into the radiator when tightening it down, hence why we only see the Swiftech MCR320 in the pictures. Please be very careful when mounting the radiator to the case so you do not puncture the radiator! Also note the radiator can be mounted externally off the back with a 140mm to 120mm shroud/adapter or mounted on top with the pre existing cut out. 3x120mm radiator mounted, second view. When mounting the optical drive and fan controller, the most difficult part was removing the faceplates to make room for the drives. After a few minutes of struggling, I chose to remove the entire front baffle in order to remove them. It pulled right off and mounted securely right back in place. Actually mounting the optical drive in the 5.25″ bay was very easy as well with Corsair’s tool free mounting setup. Slide the drive in until its flush with the front baffle, then slide the pre-mounted quick clips and voila; a quick, easy and secure mount for full depth 5.25” drives! 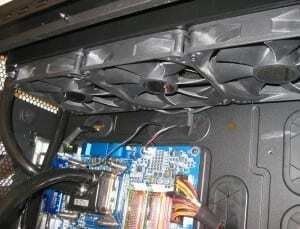 I also installed a Scythe Kaze Master fan controller that was just as easy to mount. 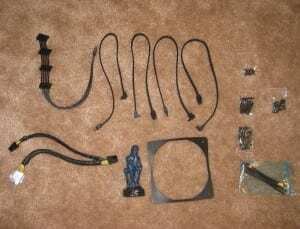 However, because of its short mounting brackets the controller is not held in place as well as a full depth drive, but it is still sufficient for the twisting and turning of the knobs without knocking it out of place. Front view. Optical and Fan controller installed. 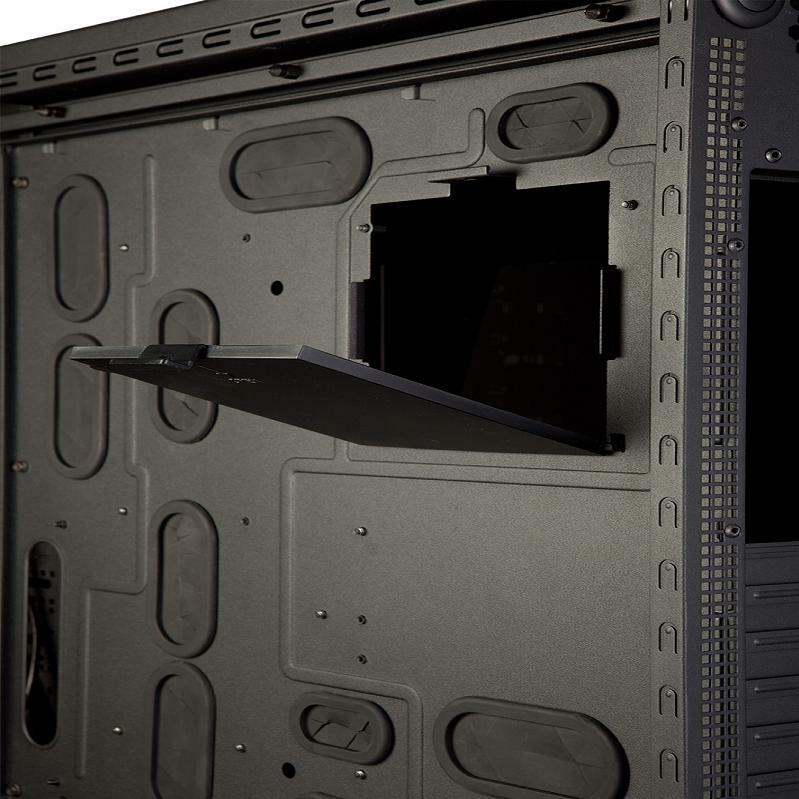 One feature in particular to note with installation is the 4 hot-swappable hard drive bays. 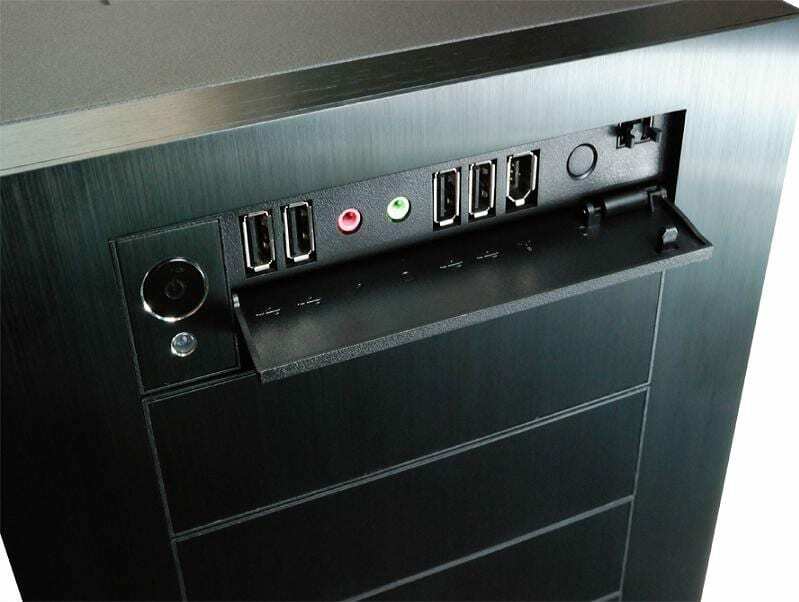 After confirming the included SATA power leads and data cables are attached to the faceplate inside the case, just pull out the drawer with the push of a button and a tug on the drawer arm. Slide your drive inside the form fitting 3.5” framework, then slide the drawer back in. The mounting is also able to take 2.5” drives like the new SSD’s. It is just mounted with 1 screw on one side of the drawer and slid into place. After the drives are secured in their home, they are cooled by their own 140mm fan so there should be no worries about keeping even the warmest of mechanical drives cool. The experience I had from this case has been overwhelmingly positive. From the sheer size both inside and out, to its pre-cut area up top for a 120mm x 3 sized radiator or fans, great cable management options, and the hot-swappable drive bays, this case offers a lot of flexibility and ease of use for even the most critical of enthusiasts. 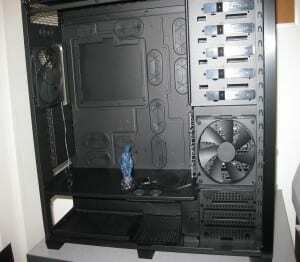 Installing the water cooling loop was a snap and everything aside from the tubing is well hidden in its place. I have to admit that when I first saw the case I was a bit nervous as to what my temperature difference would be from using an external radiator compared to one mounted inside the case as well as only having one intake fan. Even after my unfortunate mistake necessitating a new, less effective radiator, the temperature difference is still only about 3-5C with intake temps to the radiator differing a mere 2C from ambient. Not bad at all. Routing the rat’s nest of wires coming from a non-modular PSU also proved to be a breeze with the ample room in the PSU area as well as behind the motherboard tray and drive bays. Some minor drawbacks I have are the quality of the paint inside the case as it seemed quite easy to chip it off. I do not believe for a case costing this much that it should be as easy as dropping a Phillips head bit on its side from only six inches above the case to chip the paint. I would have also liked to have seen the eSATA port on the front, as well as having at least the option to mount 5.25″ drives with two screws just in case one wants an item that is not full depth mounted more secure. Wrapping up, with a price tag of $279.99 + $28.99 S+H from newegg.com, or $289.99 shipped from zipzoomfly.com it’s a pricey case. 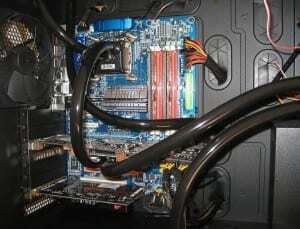 However, with its solid design features for air or water cooled systems, superior cable management options, quality construction materials, hot-swappable SATA bays, and the ‘wow’ factor for size, it’s worth the cost, especially if you were looking to mount a up to a 120×3 sized radiator internally. Corsair has made a nice splash into the case market with its first offering. I’m looking forward to seeing a standard Mid-Tower sized case from them along these lines. Here is to hoping they actually have one planned. Thanks for the review Earthdog - I'm not up to date on the latest cases, but I was really impressed to see how cable management was handled here. It's dead easy. W00t! The article looks great!!! Thanks for the help there! I love this monster. I told myself in the past I would never pay more than $100 for a case. I now know the many reasons why you should pay good money for a case. I love this thing. Cable management is absolutely the best I have seen and definately used. Im a stickler for a clean looking setup and this allowed me to do so very easily. Not a big fan of expensive cases either but it is very nice looking. Also the incorporated sata backplane probably adds to the value of the case without adding that much to the cost. I am soo buying this thing next! I just hope I can come up with the cash for this and get started on my liquid setup and still be able to finish the current engine im building as well. Ive been looking for a clean non cheesy looking and functional case for a while now that fix my needs and I believe this is definitely it. I discovered it a couple of weeks ago and while reading a review of the features I found myself repeatedly saying "No Way!". Props Corsair, I am impressed. I love this case, but the price is a bit too rich for my blood at the moment. I also like how it's roomy enough for an EATX board. I am still considering this case in my thread about cases. been out of the loop for a few , Antec 900 was the last case I fell in love with , but this case is sooooo much hotter that the 900 . beyond ubersexy ! if I didnt have them stupid bills to pay for I would be all over this case .